We found a striking association between the required involvement of instructional designers or design teams and diversified online student interaction. Other things being equal, a systematic approach to online course design means a better student experience. Online Growth — In an otherwise weak enrollment environment, online keeps growing. 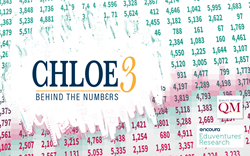 Median online enrollment growth among CHLOE 3 respondents was 10% between Spring 2017 and 2018. Councils and Committees — The emergence of online-focused committees and councils in all sectors of online learning. Neglect of Blended — Despite evidence of student demand for blended options, CHLOE 3 respondents reported that blended course enrollment growth is less prevalent than for fully online courses, and median growth rates are lower. Alternatives — A significant interest in alternative models and credentials, but a lack of investment. “This year’s report reflects the continued evolution of online learning from a tool for access and scale, toward a strategy to improve outcomes and equity at scale,” shared Whitney Kilgore, Chief Academic Officer at iDesign, CHLOE 3’s platinum sponsor. A summary of Eric Fredericksen’s work in identifying the background, characteristics, and organizational placement of online learning leaders. Eric is the Associate Vice President for Online Learning at the University of Rochester. Quotes from COOs on several contentious issues, including online governance and the role of instructional designers in online course development. This report was made possible through the partnership of QM and Eduventures Research — a division of ACT® | NRCCUA® — and the support of sponsors iDesign, ExtensionEngine and Instructional Connections. To download the report, visit the Quality Matters website or the Eduventures Research website.